The financial hub of Switzerland, Zurich is most often associated with money and banks. Kick off your visit on the 15th (Tue): explore the activities along Lake Zurich and then appreciate the extensive heritage of Old Town (Altstadt). On the next day, take in the awesome beauty at Mt Pilatus, snap pictures at Chapel Bridge, and then take a stroll through Bahnhofstrasse. To find photos, other places to visit, maps, and tourist information, read our Zurich online trip itinerary builder . If you are flying in from Canada, the closest major airports are Zürich Airport, Basel Mulhouse Freiburg and Bern Belp Airport. In January, daytime highs in Zurich are 5°C, while nighttime lows are -1°C. Finish up your sightseeing early on the 16th (Wed) so you can go by car to Interlaken. Nestled between Lake Thun and Lake Brienz in the heart of the Jungfrau region, Interlaken became popular for its proximity to the mountains and lakes of the Bernese Oberland region. Start off your visit on the 19th (Sat): cruise along BOHAG Helikopterrundflug, then fly like a bird with a parasailing or paragliding tour, and then look for gifts at Albert Schild AG - Swisssouvenir. To see maps, other places to visit, photos, and other tourist information, go to the Interlaken vacation planning site . Traveling by train from Zermatt to Interlaken takes 3 hours. Expect a daytime high around 2°C in January, and nighttime lows around -3°C. Wrap up your sightseeing on the 19th (Sat) to allow time to drive to Zurich. Best known as home the Matterhorn mountain, Zermatt serves as a chic ski resort town of the Swiss Alps. Kick off your visit on the 18th (Fri): don't miss a visit to Photopoint Kirchbrucke bridge, enjoy some diversion at Clay Shoot Zermatt, take in the views from Hangebrucke, then take your sightseeing to a higher altitude at The Matterhorn, and finally take in the spiritual surroundings of Kapelle Winkelmatten "Zur Heiligen Familie". On the next day, pause for some serene contemplation at St. Mauritius Church Zermatt, then fly down the slopes at Matterhorn Ski Paradise, and then take some stellar pictures from Gornergrat. 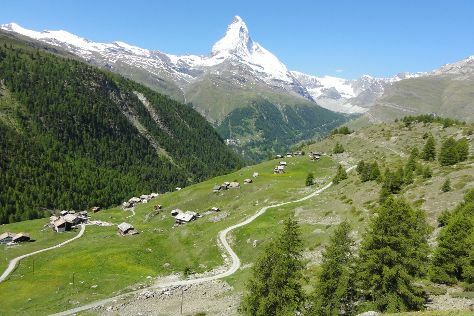 To find reviews and tourist information, read Zermatt trip itinerary planning tool . Getting from Interlaken to Zermatt by train takes about 3 hours. Finish your sightseeing early on the 19th (Sat) to allow enough time to take a train to Geneva. On the 15th (Tue), explore the activities along Lake Geneva. On the 16th (Wed), you'll have a packed day of sightseeing: admire the local landmark of The Geneva Water Fountain, then pause for some photo ops at Reformation Wall (Mur de la Reformation), then admire the striking features of Cathedrale de St-Pierre, and finally examine the collection at Patek Philippe Museum. 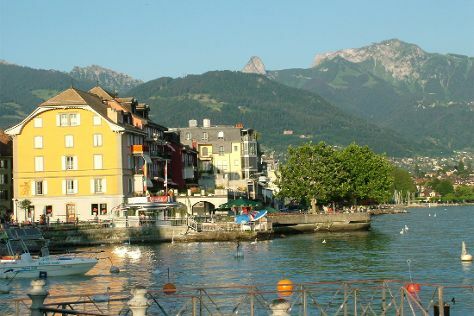 You can plan Geneva trip in no time by asking Inspirock to help create your itinerary. Zurich to Geneva is an approximately 2.5-hour flight. You can also take a train; or drive. In January, daytime highs in Geneva are 6°C, while nighttime lows are 0°C. Finish your sightseeing early on the 16th (Wed) to allow enough time to take a train to Zermatt.